Explains egg donation through pictures and simple words. 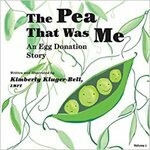 Kluger-Bell, Kimberly, "The Pea That was Me: An Egg Donation Story" (2014). DIVerse Families. 323.